NEUHÄUSER offers optimal solutions for the preparation of cooling lubricants. These include automatic magnet filters, compact and paperband filters, customised plants (such as coolant preparation plants with conveying equipment, pre-filters and main filters), coolant tanks with pumps, cooling units as well as the respective control systems. The NEUHÄUSER delivery programme for the separation of ferrous parts from bulk goods comprises manual and automatic equipment and systems. These range, from plate magnets and magnetic grids through to overhead magnetic separators, separating drums, separating chutes and belt rollers (and many more besides). Separation units are used by manufacturers and operators of shotblast machinery, in mill operations, the plastic and recycling industry, gravel pits and mining operations as well as in textile and wood-working industries. 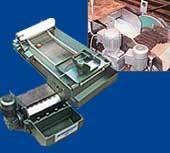 NEUHÄUSER offers different components for complex requirements involving conveying and separation technology. 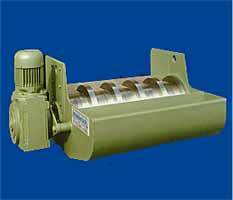 A wide variety of electrically operated permanent magnet systems is available. These are supplemented by the respective electrical control systems, magnetic sheet separators for fanning the sheets in de-stacking operations as well as permanent-magnet transport rollers and holding systems. NEUHÄUSER also installs complete systems with all of the required accessories. Following installation, NEUHÄUSER engineers carry out the commissioning and optimisation of the system. NEUHÄUSER quality is our top priority for all projects. Das NEUHÄUSER-Lieferspektrum zur Abscheidung von Fe-Teilen aus Schüttgütern umfasst manuell und automatisch abscheidende Geräte und Anlagen, von Plattenfängern über Filterroste bis hin zu Überbandmagneten, Scheidewalzen, Separierrutschen, Bandrollen und vieles mehr. Separiereinrichtungen finden ihren Einsatz bei Strahlanlagenherstellern und -betreibern, in Mühlenbetrieben, in der Kunststoff- und Recyclingindustire, bei Kies- und Bergbaubetrieben sowie in der textil- und holzverarbeitenden Industrie. Komplexe Aufgabenstellungen in der Förder- und Separiertechnik realisiert NEUHÄUSER mit unterschiedlichen Komponenten. Es steht eine Vielfalt von elektrisch schaltbaren Permanentmagnetsystemen zur Verfügung. Hinzu kommen dazugehörige elektrische Steuerungen, Spreizmagnetsysteme zum Auffächern der Platinen bei Entstapelvorgängen sowie permanentmagnetische Transportrollen und Haltesysteme. NEUHÄUSER installiert darüber hinaus Komplettanlagen mit allem erforderlichen Zubehör. Der Montage schließt sich die Inbetriebnahme und Optimierung durch NEUHÄUSER-Ingenieure an, denn höchstes Gebot bei allen Projekten ist die sprichwörtliche NEUHÄUSER-Qualität.